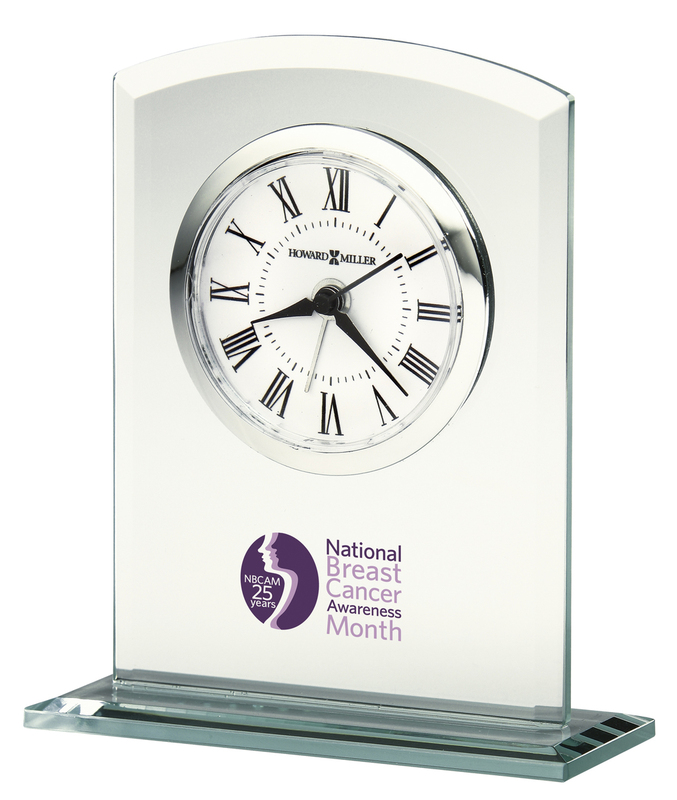 The dial is suspended within the curved, beveled glass of this Howard Miller tabletop clock, which sits on a beveled glass base. The white dial features black Roman numerals and tic marks, a polished silver-tone bezel, and a shatter-resistant convex crystal. Black tapered hour, minute, and seconds hands with a silver alarm hand. A felt bottom protects your desk or tabletop. Quartz, alarm movement includes 1 LR44 battery. Customization charges additional. 4 3/4" x 4" x 1 1/2"
All production begins after paper art is approved. Allow three (3) working days for proof; seven (7) working days from signed paper art approval.